CHAGUANAS bus accident victim Khemraj Ramgohan said he is lucky to be alive, and is convinced God saved him for another purpose. 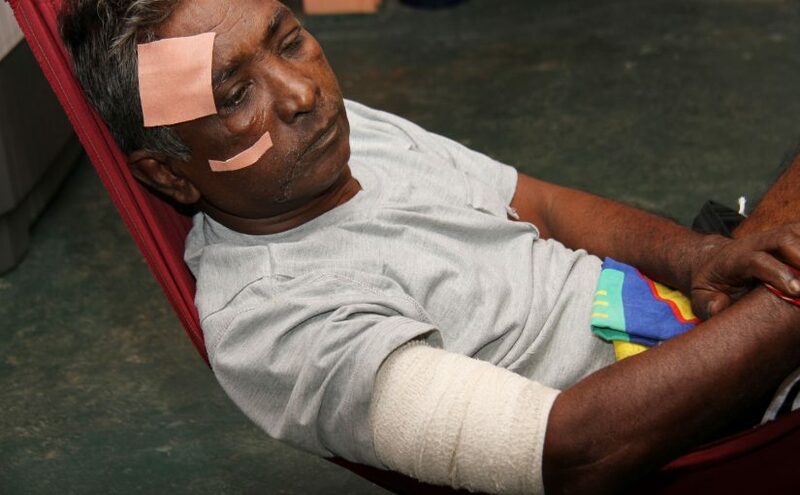 He said the impact of the Blue Waters delivery truck crashing into the Public Transport Service Corporation (PTSC) bus in which he was among 50 passengers a week ago, knocked him unconscious and rescuers thought he was dead. He had been sitting close to Tara Baboolal of Penal and Judy Marcia Reid of Diego Martin, who both died in the crash. Ramgohan said he was told later that he and the two dead women were the last to be taken out of the mangled wreck, and it was only when the fire and police officers tried to move him that they realised he was breathing. “I was told they broke off a piece of the windscreen and took me through there. "When I catch myself, I was in the ward at the Eric Williams Medical Sciences Complex (EWMSC) under heavy pain and real bandaged,” he told Newsday from his home at Rousillac Village, where he is recuperating. Ramgohan, 62, who works with the Ministry of Legal Affairs, was sitting two rows behind the bus driver, Seelal Monkissoon and directly in front of Baboolal. “I was reading a newspaper when she and I started talking. I fold the newspaper and was putting it in my briefcase and as I turned around to talk to her – that was it. "It was the worst nightmare. She get mash up real bad. The other lady (Reid) get a piece of iron in her chest. "Right now, I only hearing voices bawling in my head. Only voices, voices, bawling. 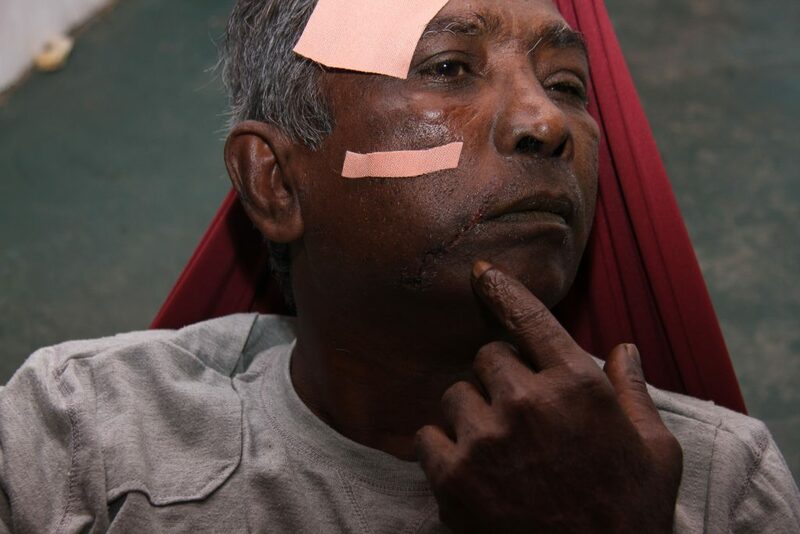 [caption id="attachment_750454" align="alignnone" width="1024"] Rousillac man, Khemraj Ramgohan, 62, shows the injuries to face caused during the vehicular accident with PTSC bus and Blue water Truck last week Tuesday on the Solomon Hochoy Highway. Ramgohan suffered a deep gash to his forehead, and others from his upper lip to his chin, in his right arm, and other parts of his face and body. “All the fatalities were right around me. I don’t know how I survived. I believed it was divine intervention from above, because I see hair and brain scattered on the bus before I passed out. "My briefcase, which I got back from the police station on Friday, was full of blood – when my wife opened it she nearly passed out. After that harrowing experience, Ramgohan said the nightmare continued at the EWMSC, where he spent almost four days. After complaining about the poor treatment, he was discharged on Friday with an IV needle still embedded in his skin above his eye. He said he got no medication and no appointment to return to the out-patients clinic. He said he asked to be transferred to the San Fernando General Hospital (SFGH) instead and to be taken by ambulance, but both requests were denied. On his way home, Ramgohan asked his relatives to take him to the SFGH, as he was feeling unwell and concerned about his eyes, which were still swollen. He was immediately attended to at the SFGH and kept overnight, then discharged on Saturday with a prescription and an appointment to return to the eye clinic on Tuesday. He said SFGH doctors also explained there was no need to ward him as he did not require surgery. They told him the pain was due to the many blows and cuts to his body, which staff there and at Mt Hope took care of. He said the one concern of the doctors at SFGH was his eyes and he is now a patient at the hospital’s clinic. In comparison he was saddened that all the horror stories he had heard about Mt Hope seemed to be true. NCRHA’s communications manager Peter Neptune did not respond to a message asking for a response. The post Bus accident victim lucky to be alive appeared first on Trinidad and Tobago Newsday.